Swati Lakra emphasised how important it was for women to report workplace harassment and speak to internal complaints committees of their organisations. 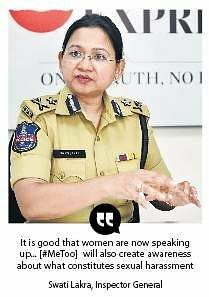 HYDERABAD: Inspector General of Police (Women’s Safety) Swati Lakra on Thursday said she wholeheartedly supported the #MeToo movement that has taken social media by storm with women opening up about how they had suffered at the hands of harassers. 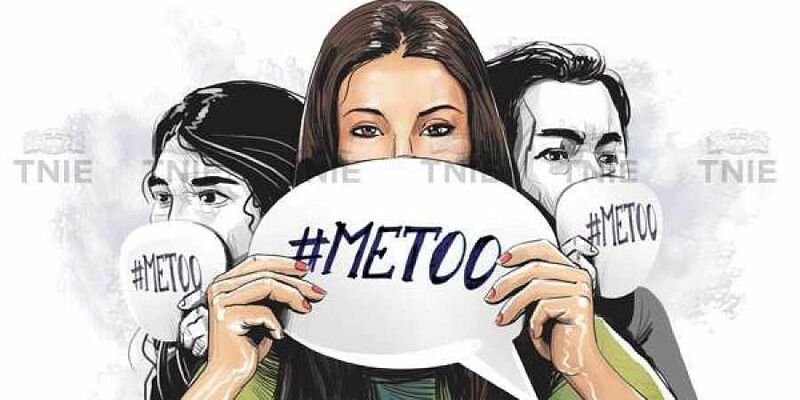 While interacting with TNIE’s editorial team as part of Express Chat, Lakra said the campaign which had opened the floodgates on a hitherto taboo topic had become a strong deterrent for sexual predators who, so far, seemed to have enjoyed a certain level of immunity. Acknowledging that a majority of the cases that had come to light through the movement was too old for conclusive investigation, she said bringing culprits to book was still not impossible. “There will be something that can come out in the course of the investigation. If the victim had confided to someone or if other people had seen the incident or if CCTV footage can be retrieved [the case can be cracked],” she said. “No evidence is not reason enough to close a case,” she said. “We do get cases from women stating how they were abused as children. We asked a woman who named her abuser to report the crime, but she didn’t. She may not have evidence as the incident happened years ago,” she said and added that #MeToo would allow survivors to get closure. “The way #MeToo is happening shows us that a lot of women did not get justice at that point in time. When one woman gathers the courage to come out and tell her story, others gain confidence to speak up too,” she said. “I am not justifying naming and shaming, but women are getting a platform to vent out about what they have gone through.”She highlighted that one of the issues that needs to be spoken about is consent. “Several people we nab said they were unaware that what they did was sexual harassment. People don’t think if consent was actually given or not and if given for how long? Police will only go by what the girl says in such issues,” she added. Lakra emphasised how important it was for women to report workplace harassment and speak to internal complaints committees (ICC) of their organisations. “Approach the ICC, start the process. If the committee fails you and you do not get justice, you are welcome to come out and complain to the police, but first start the process. No woman is bound by what the committees decide and we do get cases when the ICC hasn’t been of help,” she said.